How much are LED lights? How will my room look with LED lighting? Which lamp fittings should I choose? HOW MUCH ARE LED LIGHTS GOING TO COST? There is a wide range of LED lamps to choose from. Like any lamp, price will vary with brightness and style. Many lighting retailers struggle to offer good quality LED lamps for under $100 per fitting. This can be hugely expensive if the intention is to install or replace many lamps in one go. The Alian Electronics range is below $40 (Australian) and this starts to make them look a bit more feasible. With the large power savings of around 80% over conventional incandescent lighting,updating to safer LED technology starts to make more sense. WHY LED LIGHTING IS BETTER THAN OTHER LIGHTING? There are three sound reasons: Energy efficiency, Lighting quality and Fire Safety. Standard Halogen down lights used in many homes use about FIVE TIMES more energy as similar brightness LED lamps. Good quality LED lamps are really nice to read by. Different angles of brightness allow high light levels right where you need it without disturbing other people in the room. You also get to choose the best colour tint of light for different situations. LED lamps operate about six times cooler than standard Halogen lamps. They don't radiate much in your ceiling space, like the Halogen lamps do, which attract bugs that die and slowly build up on top of them. Standard Halogen lamps reach 250º which can set fire to these bugs when enough of them build up. WHAT DOES LED LIGHTING LOOK LIKE? With down-light illumination, the fittings can take up the same space as the common halogen lamps, or larger fittings with more diffuse light are available. But what most people really want to know is how LED light affects what a room looks like and how they would perform at their own location. See our gallery of images by clicking the link below to get a better understanding of this. 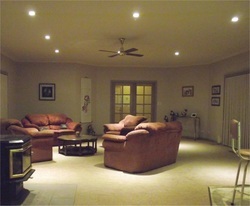 Click HERE to view different LED lighting installations. There are many choices when selecting lamps, brightness, hole sizes, Silver vs White face etc. This section provides some hints on the practicalities of new LED lamp installations or upgrades from existing lamps. Click HERE to find out more about the selection process.